PEPSI COLA HITS THE SPOT: After the rebirth of Pepsi by the Pepsi-Cola Corp. in 1934, Charles G. Guth (the new owner of the Pepsi trademark) built the then largest Pepsi bottling plant in the industrial neighborhood of Long Island City, Queens on the East River. The facility manufactured their own syrup from cane sugar and produced its own bottle caps. In 1938, Pepsi commissioned the Artkraft Strauss Sign Corp. to build a sign to adorn the top of the Long Island City plant. The sign is 120 feet wide with it’s tallest letters over 44 feet tall. A 50 foot tall capped bottle of Pepsi sits to the right of the brand name. The sign was refurbished in 1994 by the same company that constructed it in the 1930’s. The plant was in operation until 1998. The land was sold to the Rockrose Development Corp. and an agreement was made that the sign be preserved. Since then, the sign has found a permanent home on the Queens waterfront not far from the foundation of the old plant. 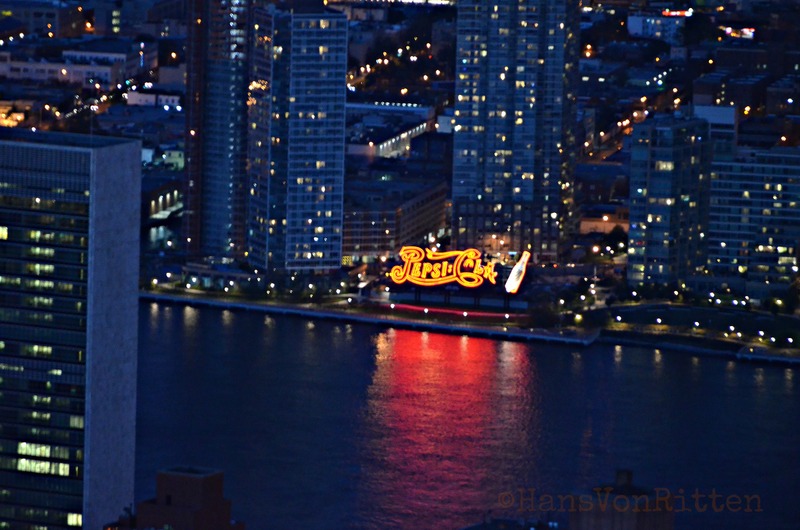 The sign can be seen clearly from Manhattan on the east side of the city and one of the attractions from atop The Empire State Building. This entry was posted on September 19, 2012 by newyorkcityinthewitofaneye. It was filed under DAILY PHOTOS WITH STORIES OF NEW YORK CITY and was tagged with Empire State Building, Hans Von Rittern, Long Island City Queens, New York City, nightime view, Pepsi Cola, United Nations.